185K+ Books, But Where are All the Magazines? I'm thrilled that the amount of Kindle content available continues to grow but it's obviously all about books. One could argue that the number of newspapers isn't likely to spike till the Kindle installed base grows dramatically, particularly in areas outside NY, LA, Chicago, etc. ; I figure I'm the only Kindle owner in the entire state of Indiana, which probably explains why the Indianapolis Star isn't available yet. What bothers me most is the thin assortment of magazines for the Kindle. 18?! Where's BusinessWeek? FastCompany? Wired? All of these would be excellent choices for Kindle editions. I currently have paper subscriptions for the latter two and would gladly drop them for the Kindle edition, even at a higher price. I also get Time and MIT's Technology Review on my Kindle and I'd gladly add more. Given that the Kindle is still in its early adopter phase, why aren't there more technology and other early adopter magazines available for it? And so it's come to this. I suppose it was unavoidable. Oprah is apparently going to gush about the Kindle on her TV show today, so much so, in fact, that Amazon is offering $50 off the price of a Kindle for Oprah viewers. If you don't want to visit that page, just use the promotional code OPRAHWINFREY at checkout between now and November 1st. It will be interesting to watch Kindle sales rates over the next few days. Oprah has proven to be extremely influential in the book world and I have no doubt she'll cause Kindle sales to spike. 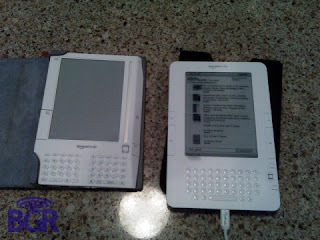 Then again, it's one thing to hype a $20 or $30 book, but will her magic work as well on a $300 dedicated e-reader? Now that I've reentered the Twittersphere I have a request. Amazon, would you please integrate Twitter with the Kindle? Yes, I know that with enough patience I could Twitter from my Kindle; after all, it has a browser and a web connection already. I'm talking about something more usable. I can't tell you how many times I've recently had the urge to grab a piece of Kindle content and Twitter it. Some of my recent tweets have been about Kindle content. For example, I'm in the midst of reading Lawrence Lessig's Remix and I've tweeted a number of times when I ran into an interesting point. I would have tweeted even more if it wasn't so cumbersome. Here's what I'm talking about... Every menu on the Kindle should include a Twitter option. No matter where I am in The New York Times, a magazine or a book, I should be able to click on the Kindle wheel and immediately Twitter the experience. Better yet, Amazon needs to figure out how to incorporate tiny links to all this content. If I want to share an excerpt or a story, give me a tiny url to embed in my tweet. That's not such a big deal with a newspaper like the Times, which is already accessible online...but what about the content I want to excerpt from a book? Ah, that's where Amazon needs to integrate their "Search Inside" feature with this new functionality I'm describing. I'd love to link to brief excerpts in these various tweets. I don't plan to give the entire book away...just mention a few interesting pieces of it. This last component will require buy-in from both Amazon and all their publisher partners. Open minds will immediately appreciate all the grass roots marketing this can generate for their content; others will simply get their clocks cleaned by their open-minded competitors! Come on, Amazon...make my day and fold this into a Kindle software update! I just spent the weekend on the road without a PC. The only technology I had was my Kindle and Blackberry. The bottom line is neither of these are worthy replacements for a good old web browser on a computer. The Blackberry's browser generally worked OK but at painfully slow speeds. I wish that were the only fault of the Kindle's browser. I realize the Kindle browser is still considered "experimental", but I couldn't believe how many times I got errors loading pages. I was recently in the market for a new Blackberry so I visited a couple of cell phone providers to see what they had to offer. I wound up going with AT&T but the myFaves program at T-Mobile left an impression. I didn't see a use for it on a cell phone but I'd love to see something like it for the Kindle. With T-Mobile myFaves you get unlimited calling to any five U.S. numbers of your choice, including landlines and cell numbers outside the T-Mobile network. Have you read a Kindle edition that you'd like to pass along to a friend? We do it all the time with print books but it's impossible on the Kindle. Amazon ought to add a service where you can build a small network of Kindle friends you'd like to share books with. There are a number of ways they could implement this. Charge an annual or monthly fee. Only let the book be active on one device at a time. Better yet, have a couple of plan tiers where the lower rate means the book is active on one device at a time but a higher rate enables multiple active copies. I'm only scratching the surface but you get the point. The key is to offer more content acquisition models since each one is likely to cast a broader customer net. It might just encourage more reading along the way, and launch a real Kindle social network, which isn't a bad thing either! I just noticed that Lessig's next book, Remix: Making Art and Commerce Thrive in the Hybrid Economy, is due out tomorrow. I thoroughly enjoyed one of his earlier books, Free Culture, and couldn't resist the Amazon 1-click pre-order process for Remix...it should be on my Kindle tomorrow. Btw, this means I just broke a firm Kindle rule I thought I'd abide by forever: It's the first time I've bought a book for more than $9.99. Oh well. I guess we all have favorite authors we're willing to pay a premium for. As part of that "See a Kindle in Your City" campaign I wound up connecting with another prospective Kindle customer at a local Starbucks last night. (My wife thinks this is kind of creepy and wonders if I'll get abducted doing it one day...) This guy's eyes lit up when he saw the device in person. In other words, he had the same reaction everyone has had when they first see my Kindle. I told him he should also check out the Sony Reader at the Target across the street. Like others I've mentioned this to, he also had no idea they were being sold at Target. A week ago I mentioned the idea of Amazon partnering with Starbucks to sell the device in all their coffee shops. My new Kindle buddy thought that was a good idea but figured neither party would want to have all that inventory spread across the zillions of Starbucks around the country. Good point. So why not just have a demo unit or two on display for customers to check out firsthand? Be sure to either configure it or the store registers to allow customers to order one on the spot. There's no instant gratification in this model, you say? Well, hasn't Amazon fought that battle since day one? Customers won't get their Kindles till the next day, but that's the way every Amazon order already works...and at least with this model more and more people will finally see this excellent device in person. 1. Include motion activated scrolling and page-turning. This is the feature you see on so many of the newer iPhone 3G commercials. I think it looks cool on TV and it might be a nice feature for iPhone games but I'm not sure it would be a big deal on the Kindle. All you're doing is adding to the manufacturing cost for a gimmicky feature. Why not simply fix the poorly placed next/previous page buttons that already exist? 2. Try different content pricing and distribution models. Amen, brother! Whether it's a subscription model, all-you-can-eat, whatever...just get creative here, learn from other industries and see if there's a way to leverage this approach to lower the device's price. 3. Add brick-and-mortar distribution. Or, as Roush accidentally (?) called it in his article, "brick -and-mortal." Given that one definition of "mortal" is "subject to death", do you suppose that's why Amazon has shied away from them all these years? :-) Roush's typo aside, I totally agree with his point about partnering on this front. People's eyes light up when they see a Kindle and can play around with it. 4. Add a talking book feature. I've talked about this one before as well. My eyes get tired reading regardless of whether the content is on paper or a Kindle screen. Why not create a hybrid product that let's me flip a switch, close my eyes and read the content to me, right where I left off when my eyes tired? We'll get this feature someday I'm sure. Are you familiar with Amazon's "See a Kindle in Your City" campaign? It's a great idea where Amazon uses Kindle owners to help sell the device to curious prospective customers. I put my name on the list awhile back and have had a few inquiries. My first two meetings are scheduled for next week at one of the local Starbucks. The Kindle and Starbucks both appeal to a wealthier crowd. Given the current economic conditions it seems just as hard to justify buying an overpriced latte as a dedicated e-book reader. Starbucks seems to attract a lot of bookworms. Have you ever noticed how many people are sitting around sipping and reading there? And if they're not reading, they're fiddling with a computer or some other gadget. I'll bet there are a lot of early adopters in that crowd. It's a branding thing. I'm no coffee connoisseur but I don't find Starbucks drinks all that special. In fact, I couldn't tell whether a cup of java is from Starbucks or McDonalds. Seriously. So when I see people walking around with their Starbucks cups, all I can think of is, "yeah, you're trying to show the world you're not afraid to drop five bucks on a 50-cent cup of coffee." Starbucks is the Apple of beverages. If Apple didn't have their own retail chain they probably would have infiltrated Starbucks by now...so why shouldn't Amazon do just that with the Kindle? The Kindle 2.0 rumors are picking up steam again. And now there are photos of an actual device floating around. As the picture to the left shows, version 2.0 will apparently be about the same size as 1.0. The photos show they're also changing the chicklet keyboard as well as the scroll wheel (with a joystick). The overall design still has a very 1980's feel though, so the advantage goes to Sony on the eye candy factor. Here's what I don't understand: This story says the SD card slot goes away in Kindle 2.0. Why?! I don't care that they're increasing the memory...I put all my music on SD cards and like to swap in and out as the mood suits me. Now I'll always have to load the music on the device? Not a good idea. If you look at this picture you'll see the back side will have a brushed metal finish. The back panel no longer slides off, meaning the battery probably can't be easily replaced. So the back side will look sleek while the front, well...I guess we're buying Kindles to read with, not show off. I'm not sure a brushed metal backside is worth the loss of the SD slot and replaceable battery. More importantly, will I still be able to get to the paperclip-powered reset button if the back won't come off? ...and nobody came? As noted in this post on the GalleyCat blog, a well-known pirate is apparently looking to crack the Kindle's DRM and Napsterize the platform. The GalleyCat post goes on to quote another Kindle blogger who says that "I really think we are going to see the napster of books - sooner or later." This has already happened with sites like Scribd, for example. What we haven't seen yet though is a bunch of hacked Kindle editions floating around on these sites. I tend to agree with that same Kindle blogger who said that the lower Kindle edition prices (vs. print prices) makes piracy less attractive. IOW, why steal the content when the price is already quite reasonable? As both a publisher and a Kindle owner I hope this proves to be true. Authors still need to be able to earn an income from their efforts.